The Kingdom Inquirer is an issue of Valiant's Nintendo Comics System imprint. In the castle, Toad has just received a package from a postal worker and is messily opening it as Wooster looks on. As Toad opens his package, he attempts to goad Wooster into guessing what he has received, which prompts Wooster to ask if Toad has gotten another coffee table book; replying no to Wooster, Toad tells him that he has just gotten his graduation package from "The Apook Correspondence School of Journalism, Hotel Management and Transmission Repair" and goes on to say he was lucky to get accepted into such a prestigious institution. Wooster, unimpressed, says to Toad that he first found out about the correspondence school by reading the back of a matchbook and that the entire curriculum of the school consisted of Toad sending them a check. Toad, not caring about Wooster's criticism, grabs the reporter gear that was in his graduation package, just as Mario and the Mushroom King exit a nearby door. Overhearing Mario and the Mushroom King talking about a top secret mission, Toad begins to follow Mario, saying that he is going to report about his secret mission. As Toad walks with Mario, who is somewhat irritated by Toad, he begins to narrate and write every move he and Mario make, adding some exaggerated details to them though; after some walking, Mario and Toad reach a Warp Pipe which deposits them in World 1-3, where a Boomerang Brother, overhearing Mario and Toad talking about a secret mission, attacks the two. Evading this Boomerang Brother, Mario reprimands Toad for continually talking about his secret mission; eventually becoming annoyed with Toad, who continues to quote passages from his Reporters Hand Book, Mario decides to go off on his own, leaving Toad, who wants to write a story, alone. As Mario leaves, Toad is suddenly addressed by the Shrubs, two movie star bushes who tell Toad they have a story for him. Interested, Toad begins to interview the Shrubs while Mario uses several nearby ♩ Blocks to jump on to a cloud in the sky. On this cloud, Mario sees several nearby Coins, which he claims will help him balance the Mushroom King's budget problems. Down below, Toad is, quite unsuccessfully, trying to use a ♩ Block to jump into the sky like Mario. As Toad frantically hops up and down on the Jump Block, he is approached by two Hammer Brothers; as Toad, panickingly, looks through his Reporters Hand Book, one of the Hammer Brothers deduces he is a reporter and convinces Toad to let him tell him some stories. 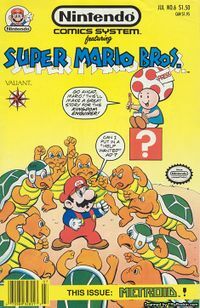 As the two Hammer Brothers, identified as Gary and Jason, begin to tell Toad about several odd incidents involving them, several more Hammer Brothers, as well as Koopa Troopas and Koopa Paratroopas, join them. As the Koopas tell Toad, who fakes being uninterested, about various incidents, Mario, who is still on a cloud, takes notice to the growing number of Koopas below. Eventually, things get out of hand when the Hammer Brothers, Koopa Troopas, Koopa Paratroopas and even several Bullet Bills begin to fight amongst themselves for a panicking Toad's attention. Noticing a frantic Toad running from the enemies, Mario leaps down from his cloud near Toad, who is panting heavily near a Warp Pipe. Seeing Mario approaching him, Toad introduces him to all the nearby enemies, who decide to beat up Mario in order to get a reward from Bowser; preparing to attack Mario, a nearby Koopa Troopa says that Toad should write about their attack on Mario. Toad responds to this comment by saying he already has and tells a nearby Koopa Paratroopa to deliver his transcript to the offices of The Kingdom Enquirer, which the Paratroopa cheerfully does. It is only when the Koopa Paratroopa leaves that Toad tells all the surrounding enemies that he has entitled his story as "The Trouble With Troopas" and goes on to say that he actually wrote about all the secrets he was told, saying King Koopa will probably punish all the enemies present for telling confidential information and for doing such things as stealing Bowser's money and personal chocolates. Horrified by this prospect, the enemies leave Mario and Toad alone and begin to chase the Koopa Paratroopa with Toad's transcript, wanting to stop him from getting the transcript printed in The Kingdom Enquirer. With all the enemies running after the Koopa Paratroopa, who believes the footsteps of his associates to be approaching thunder, Mario asks Toad if he found out any other secrets today. Despite Mario's pestering of him, Toad resolves to not reveal anymore secrets, saying that he has to protect his sources and that he can keep his secret. This page was last edited on November 24, 2018, at 11:33.